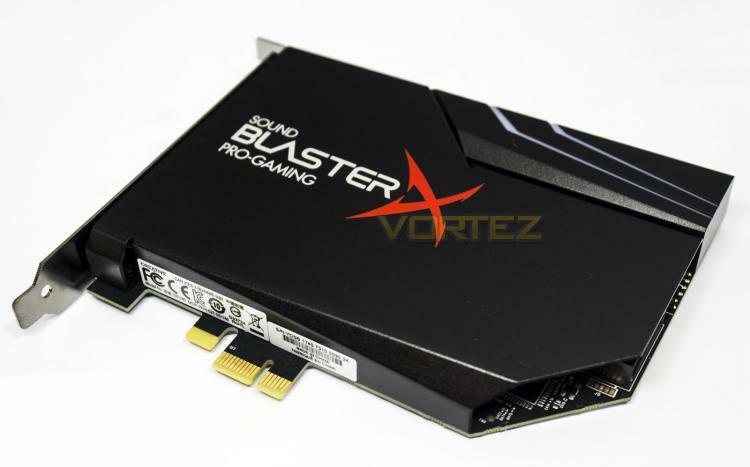 The AE-5 is Creative's first discrete soundcard of the Sound BlasterX gaming series operates with a dynamic range of 122dB, and features the ESS SABRE32 DAC to deliver high quality 32-bit filtering for low noise and distortion. It can support up to 5.1 surround speaker systems, and features a custom bi-amplified headphone amp (Xamp) that supports up to 600ohm headsets; for added measure there is also a TOSLINK optical output. Also, for sake of convenience the AE-5 has a front panel audio connector. RGB LEDs are all the rage right now and having that in a discrete soundcard is something that many people may not spring to mind for many, but with the Sound BlasterX AE-5 it is certainly available alongside Creatives Aurora Reactive lighting which can provide advanced lighting effects beyond that supplied by most motherboards, this is why the lighting effects are extended beyond just the soundcard itself with the included RGB LED strip which can be plugged into the soundcard, and features a series connector to add additional RGB LED strips in future. Should you LOVE RGB lighting that bit more, you may want to consider the PURE edition exclusively available from the Creative website. The PURE edition features a white shroud and is supplied with 4x RGB LED strips, enough to line your mid-tower case entirely.